9. "C. Scorecard Values"- Now we get into the real dashboarding exercises through metrics and calculations. Start by clicking the "Scorecard" button highlighted in the toolbar above. Take the cross-hair and drag it over the space you want the first scorecard value to occupy. In the “data” tab, Select the data set and appropriate metric. Start with the values in the image to the left. In the “style” tab select size 36 with the type "Roboto". 10. "D. Map" - In this step we get more impressive, but not more difficult. We implement a map! Start by clicking the "Geo Map" button highlighted in the toolbar above. Take the cross-hair and drag it over the space you want the map to occupy. Select the data set and appropriate metric as per the values in the image to the left. 11. "E. List"- Now we are going to list out all values in the Geo Map above ordered by their metric "Average Home Value". Start by clicking the "Table" button highlighted in the toolbar above. Take the cross-hair and drag it over the space you want the list to occupy. Select the data set and appropriate metric as per the values in the image to the left. As I'm sure was obvious from above, I'm impressed with their offering. But I do feel it is my duty to outline some oddities I came across. For example: when you set up your data source, you need to specify ahead of time for each column what type of summary you plan on doing with that value. If you want to use a chart to display averages, you cannot select this within the chart dynamically, it has to be at the data source. I find this odd and limiting. Additionally, the csv import has a 200 column limit and there are some formatting annoyances. Lastly, maybe I'm asking too much, but right now you cannot embed the dashboards. I really wish we could. 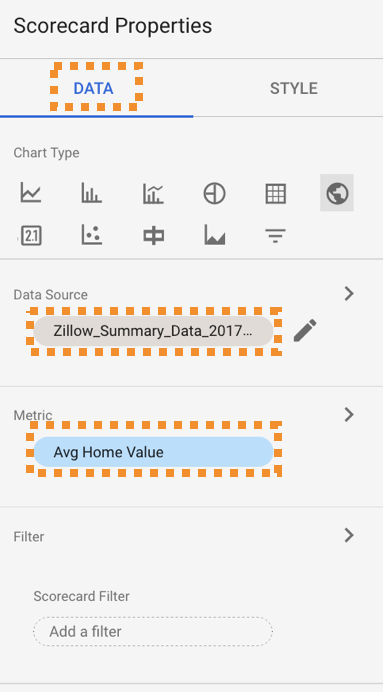 UPDATE Sept 7 2017: Google Data Studio has now released the feature to allow for embedding the reports or dashboards into a web page. See the step by step here.